Minister of Information and Telecommunications Truong Minh Tuan highlighted great potential for cooperation between Vietnamese and Czech ICT businesses in the fourth industrial revolution. Talking with the Vietnam News Agency on the occasion of his visit to the Czech Republic from December 2-3, the minister appreciated Czech’s strength in IT, e-Government and cyber security. During his stay in the European country, Tuan met with Deputy Minister of Culture Petra Smolikova, during which they informed each other about information and social development, as well as major policies on information and telecommunications of each nation. They also talked about the two ministries’ cooperation in the exchange of officials and journalists, along with the organisation of exhibitions promoting Vietnamese and Czech land and people. Tuan said the Vietnamese and Czech Governments shared concern over the adverse impacts of the breakout of social networks, noting that the two countries are seeking ways to ensure the freedom of speech while limiting such consequences. At a meeting with Czech Deputy Minister of Industry and Trade Karel Novotny, host and guest discussed orientations for cooperation in sharing experience in policy and institution building, ICT application, e-Government and cyber security, among others. 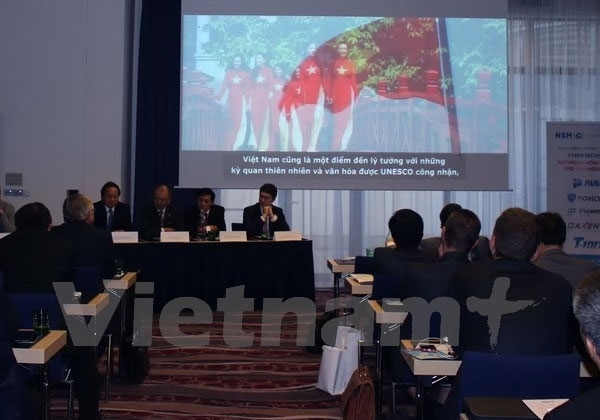 Minister Tuan, Vietnamese Ambassador to Czech Truong Manh Son, and Deputy Ministers Karel Novotny and Lukas Kaucky attended the Vietnam-Czech Business Forum on ICT cooperation, where the two countries’ businesses learnt about each other’s potential and demands. On this occasion, Tuan handed over nearly 200 photos and 2,000 discs on Vietnamese land, people and cultural heritages to the Vietnamese Embassy and the Vietnamese community in the Czech Republic. The Czech Republic was the last leg of Tuan’s Europe tour, which also took him to France and Slovakia. The trip aims to enhance cooperation between Vietnam and the three countries, including the implementation of commitments and agreements between their Governments in the field of information and telecommunications, the minister said.